This session has openings. Registration for this session will end on 7/16/2019 at 1:00 AM. 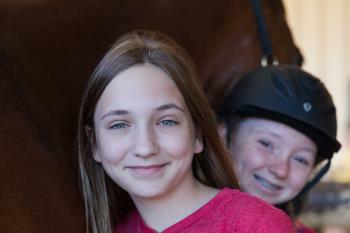 Campers get firsthand experience with western riding, outdoor scenic trail riding, grooming, saddling, and games. Cancellations made at least two weeks prior to the first day of camp will receive a refund less a non-refundable $25.00 fee. Cancellations made less than two weeks prior to the first day of camp will receive no refund. There will be no refund for those who miss any portion of the event. $20.00 Early Bird Discount A $20 credit will be automatically applied when your registration is received no later than May 1st. $20.00 Multi-Camp Discount A $20 credit will be automatically applied when your child is registered for more than one camp per summer season. $20.00 Multi-Child Discount A $20 credit will be automatically applied when you have registered more than one child per season.